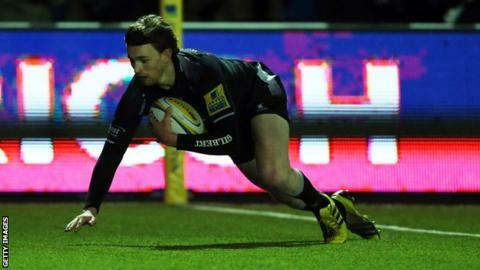 Newcastle Falcons moved off the bottom of the Premiership table with a fine victory over a below-par Leicester Tigers at Kingston Park. Simon Hammersley waltzed through the Tigers defence for the opening try before Adam Powell added a second to give Falcons a 20-9 half-time lead. Laurence Pearce crossed to reduce the deficit but the Falcons' defence held firm to see out the final 15 minutes. Newcastle have now won five straight games at home in all competitions. Tigers, who only managed a single penalty in last weekend's 10-3 home defeat by Sale, again looked short of ideas as they failed to break into the opposition's 22 in the first half. Newcastle on the other hand seemed full of confidence on home turf following back-to-back Premiership wins at Kingston Park and made their pressure count with two superbly crafted tries before the break. Full-back Hammersley ghosted through a gap following a fine overlap before Powell went over after a drive from the line-out. It took until after the hour mark for Leicester to finally string together any meaningful phases as substitute back-row Pearce dived over to make it 23-14. The visitors continued to push forward but had left it too late to complete a comeback as Newcastle earned their third Premiership victory of the season. Falcons move above London Irish and Worcester into 10th, while Leicester are third but could be overtaken by fourth-placed Harlequins who travel to Gloucester on Saturday. "I told the lads at half-time they just had to go out there and lay their bodies on the line again, and they did. "The pack were outstanding and Sean Robinson and Will Welch were outstanding in an outstanding pack. "There is now a sense of belief among the players and this team is in a good place. "We had a difficult start to the season with lots of injuries - we still have lots of players sidelined but the players now have confidence in each other and that makes it easier to play." "We got exactly what we deserved which was nothing. "We were beaten at every contact point and, clearly, Newcastle wanted it more than us. We were beaten across the board. There's no getting away from it and I'm bitterly disappointed, it's just not acceptable. "We need to take a good hard look at ourselves and put things right and do it quickly." Newcastle Falcons: Hammersley; Tait, Harris, Powell, Watson; Goode, Young; Vickers, Lawson, Vea, Wilson, Robinson, Welch (capt), Latu, Hogg. Replacements: McGuigan, Rogers, Hatakeyama, Botha, Tuilagi, Takulua, Willis, Socino. Leicester Tigers: Veainu; Betham, Tait (capt), Smith, Camacho; Burns, Harrison; Ayerza, Ghiraldini, Balmain, Fitzgerald, Kitchener, Croft, McCaffrey, Crane. Replacements: Thacker, Mulipola, Brugnara, De Chaves, Kitto, Bryant, Roberts.